Exciting stuff here at Concealed Carry HQ! We decided to try out some new tech today by recording the entire podcast episode LIVE on Facebook. Some of you were able to join us, but if you'd like to watch what transpired you can view it here: Recorded Facebook Live Video Podcast. It is an historic day with the passing of H.R. 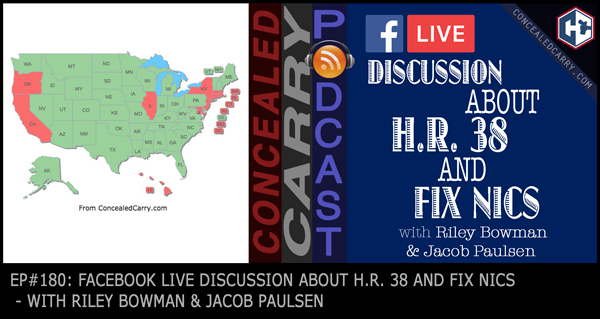 38, The Concealed Carry Reciprocity Act of 2017. Some have wondered if the “Fix NICS” bill was also included in that, and it indeed was. But the passed bill is not as bad as what we initially thought. Riley and Jacob have pored over the language in the bill and discuss what it means and its implications in today's episode. Oh and we discuss the likelihood of it getting through the Senate. Press ‘PLAY' to listen now!